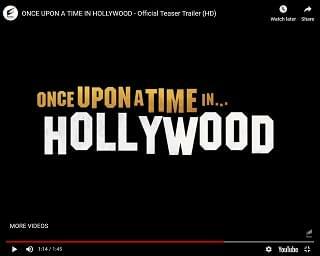 Sony Pictures has dropped the first official trailer for Quentin Tarantino’s upcoming film “Once Upon A Time In Hollywood”. The film is set in 1969 and has a star-studded cast including Brad Pitt, Leonardo DiCaprio, Margot Robbie, Al Pacino, Dakota Fanning, Timothy Olyphant and more. DiCaprio plays an actor, and Pitt is his stuntman. It’s still unclear how Robbie’s role as Sharon Tate will play into the story.